Getting arrested for relieving yourself in public is bad enough, but Gabriel Bravo was also forced to remove his extensive facial ornamentation upon being booked into a Miami jail. 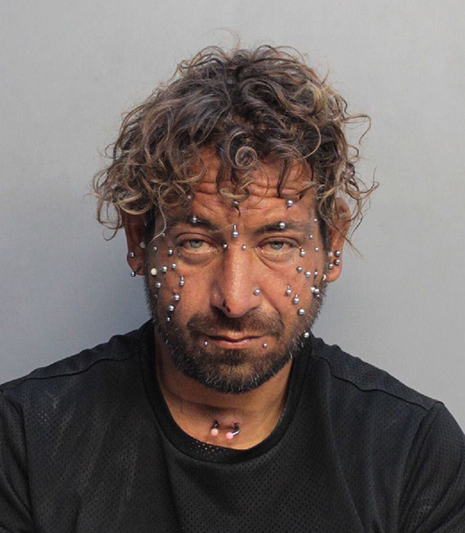 Busted last month in Miami Beach, Bravo has had his face pierced dozens of times. As seen in the above mug shot, Bravo is partial to silver balls. Upon being booked into the Metro West Detention Center, Bravo’s jewelry collection was inventoried and placed in storage (to be returned when he is released). Locked up in lieu of $100 bond, Bravo has asked for a jury trial, which is scheduled for early-July. Bravo has twice been arrested this year--for disorderly intoxication and drinking in public.